Recommended Name: � the Later Portuguese pattern. This pattern was originally classified as IP-1.31. There is something of a gap in our knowledge of developments in design which took place between the intermediate Portuguese pattern (IP-1.3) and its less rumbustious successor at present under review. It is cheering, however, to feel that the dragons on the aces, the manikin on the 2 of Batons and such features as an aggressive Maid of Batons all survived the apparent interim and not only remained or re-established themselves in their homeland and Brazil but in the 19th century became a part of the export trade (mainly, if not entirely, to Brazil) of Turnhout in Belgium and Nürnberg in Germany as well as possibly others. The Real Fabrica de Lisbõa was established in 1769 and probably made these cards from its earliest days. 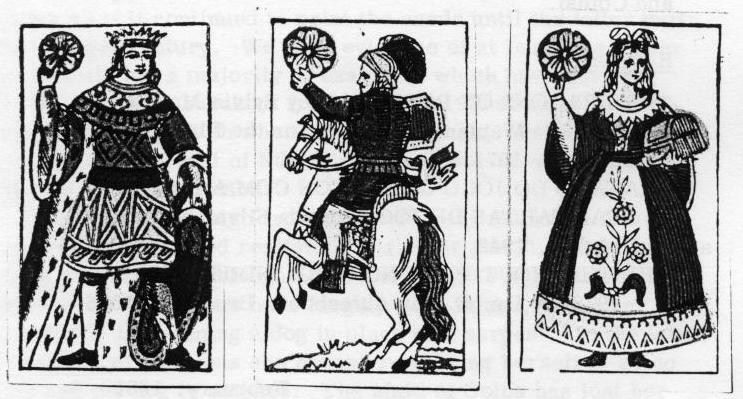 Several different qualities are known to have been produced and it looks as if it continued to print the cards until the latter part of the next century. We have evidence of at least one maker in Brazil, but a majority of examples which have survived emanated from Turnhout from the mid-19th century until the beginning of the 20th when sadly this branch of the family died out. Conrad Jegel of Nürnberg also exported such cards during the same period. Changes in design from IP-1.3 are very marked. 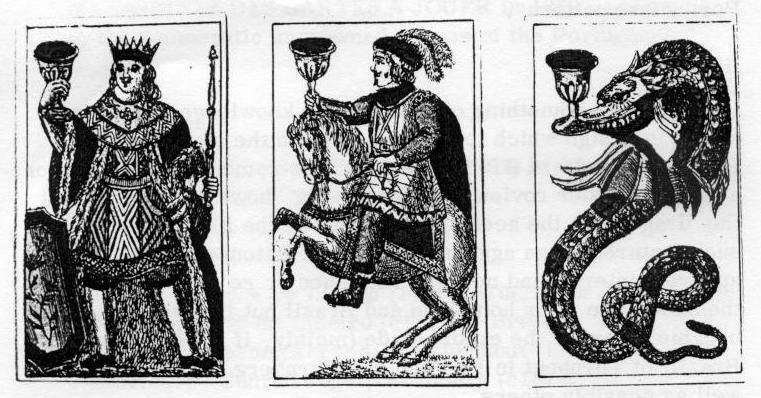 Court figures are depicted realistically and the rough, tough dragons have dwindled into elongated serpents. 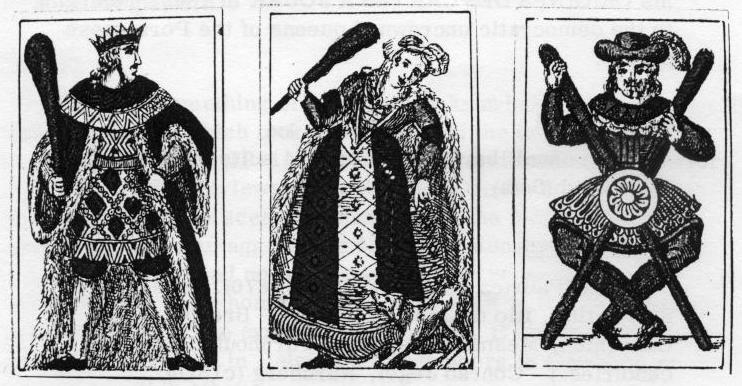 The aggressive Maids of Swords and Batons have largely been tamed, the latter half-heartedly threatening a dog in place of a serpent. In the later, Turnhout productions she cannot even bring herself to go so far and the dog is omitted. The Maid of Coins has lost her shield but gained a jewel casket. An accepted variant is provided by a Turnhout maker, Mesmaekers, who misunderstood the rank of the female court figure and crowned her Queen. (This misconception was widespread in the 19th century, even Merlin, in bis ORIGINES DES CARTES A JOUER in 1869 , referring to the democratic uncrowned queens of the Portuguese packs). The usual Iberian 48 cards. 4 suits of 12 cards; 1-9, Maid (Sota), Cavalier and King. Real Fabrica de Lisbõa (1769-1870). Luis Schlichting, Rio de Janeiro (c.1840). TRATADO DO JÔGO DO BOSTON COM A HISTÓRIA DAS CARTAS DE JOGAR by da Silva and Moniz. Lisbon, 1942. 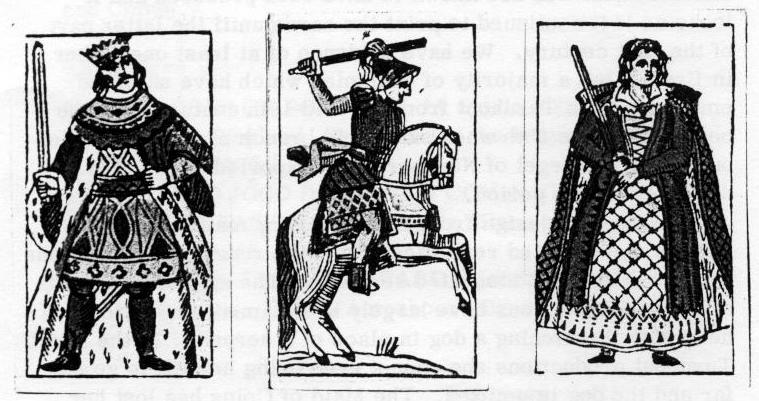 Cards made by Luis Schlichting (Cups and Batons) and the Real Fabrica de Lisbõa (Swords and Coins).